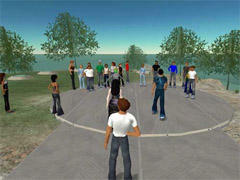 Wow, as of today the client software for Second Life has been released as open source under GPL. Stepping up the development of the Second Life Grid to everyone interested, I am proud to announce the availability of the Second Life client source code for you to download, inspect, compile, modify, and use within the guidelines of the GNU GPL version 2. A lot of the Second Life development work currently in progress is focused on building the Second Life Grid — a vision of a globally interconnected grid with clients and servers published and managed by different groups. Expect many changes and updates in the coming months in support of this architecture. Much of the recent work has centered on securing the code against potential threats. More recently and still in development, we are moving more of the communications to reliable and cryptographically strong secure channels. At Linden, we have always been strong advocates of the use of open standards and the advantages of using open source products. Though Second Life makes abundant use of non-standard technologies, our basic UDP protocol message system for example, we rely on open standards and open source implementations when appropriate and available. Since many of the components that will make up this network are not yet done, we are not publishing long white papers or RFCs at this time — instead, we are giving everyone what we have along with a goal of producing those open standards with the input and assistance of the community that has brought Second Life to where it is now. Releasing the source now is our next invitation to the world to help build this global space for communication, business, and entertainment. We are eager to work with the community and businesses to further our vision of our space. (Via BoingBoing). Yes, that is potentially HUGE. If you no longer have to be tied into just one company, which can ban you, go out of business, etc, that changes everything, and this might start working like another standard piece of the web. I can't wait to have my own world. At this point it is only the viewer software that can be downloaded, but hopefully I understand correctly that it will become all of it. ... More from CNN. Aha, they say that "eventually" everything will be open source, but that could be a while, of course. OK, but do you seriously feel compelled to tell me personally about that, but not enough to find my e-mail address? Or is this more like a blanket advertisement, which I don't really accept here. Anyway, the music and the animations on the site are very nice. can i leave it with you ming? Ha, yes, don't worry. I joined easily enough the first time, and lots of others seem to make their way there, spending a lot of time. I haven't spent much time there at all, and my kids seem to have figured it out much easier than I have. My son is using my account, so whenever I go there, I seem to have acquired a lot of new equipment and a new haircut. But if I could have my own world, that would motivate me in a different way. This truly even a decent setup that I in truth truly delighted in scrutinizing. It is not really consistent that I incorporate the alternative to find out a particular thing..
An assortment of the Second Life expansion occupation at this time in advancement is paying attention on construction the succeeding living crisscross an idea of an internationally unified crisscross among customers with servers available and manages by special assemblage. Thank you for the article. It really impressed me. I fell happy that you have a very good aim- to build the global space for communication. Nowadays, we communicate more often online so this project os really great! 15 Dec 2016 @ 15:08 by more @134.249.120.135 : Interesting! The article is really great! Thank you a lot! I really enjoyed reading it. Building the global space for communication is a great idea, actually! moviestarplanet is using online games, these games use in device iso, androids. msp games have a cheats code and free vip membership.hack msp in this games increase more then points and levels. In this game you need to be a movie star and do various stuff which leads to increase in expertise in the gaming levels.You need to increase your levels and reach the highest and become a more and more popular celebrity.The game have different modes, levels and a breathtaking gaming experience.